Turning the Vectrex console into a full blown video arcade machine. A new wooden screen bezel is complete and installed....Admittedly the Vectrex screen looks small, but the proportions look right, and the screen doesn't look ridicously small or silly in the cabinet. Actually, this is not the end of it. I have a friend who is kindly machining with a CNC machine a perspex bezel that will sit on top of the wooden bezel. In addition I have just ordered a sheet of glass that will sit on top of the perspex bezel. I have many interests. But there are two that I blog about: My experiences with my electric skateboard. My development activities concerning the Vectrex. The MB/GCE Vectrex is the one and only games console that employs vector scan rather than raster scan technology to generate images. The Vectrex was released to the video game market in 1982. Although more than quarter of a century has passed since its conception, this unique gaming system is still able to "hold its own" in the 21st century! There is an active Vectrex user community and new software and hardware continues to be developed. 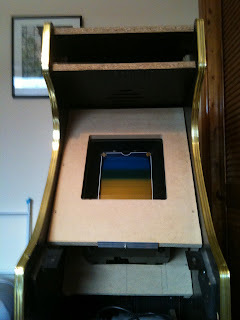 This blog document's my journey to make a full size upright arcade cabinet based on the Vectrex.